Buy One. Get One 50%. It's summer and things are heating up. 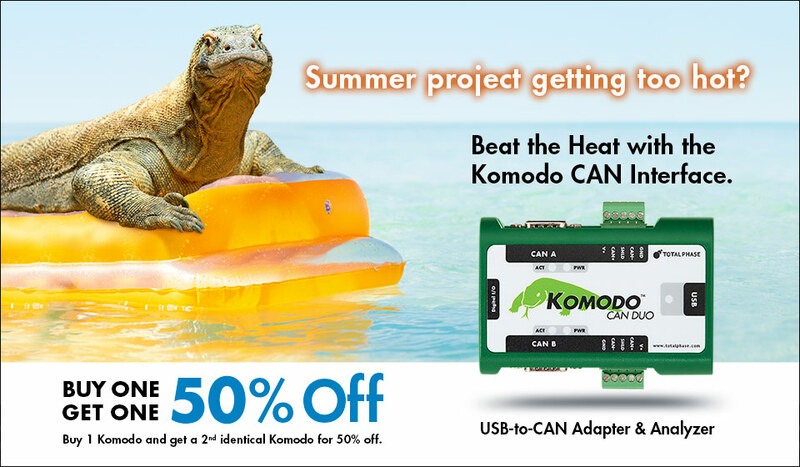 Good thing the Komodo™ CAN Interfaces are primed to help you completed your project on time so you can enjoy some fun in the sun. The Komodo CAN Interface is a powerful USB-to-CAN adapter and analyzer; it’s an all-in-one tool capable of active CAN data transmission as well as non-intrusive CAN bus monitoring. For a limited time, purchase one Komodo interface and receive the second one for 50%. To take advantage of this offer, enter coupon code “Summer2015” during checkout to receive your discount. This promotion expires June 30, 2015, so act fast. SATISFY THE NEED FOR SPEED! Our modular future-proof design will soon offer 80 MHz clock speeds, full support for Quad I/O SPI, faster and more advanced slaving capabilities plus many more features. Want to upgrade your Aardvark I2C/SPI Host Adapter to a Promira Serial Platform? Click here for details. Very helpful in my debugging.